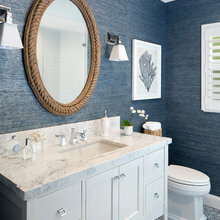 N. Shore Kitchen & Bath Remodeler + General Contractor- Best of Houzz! 25 Projects for New Explode Construction INC.
38 Reviews for New Explode Construction INC. I will hire New Explode for all of my needs! 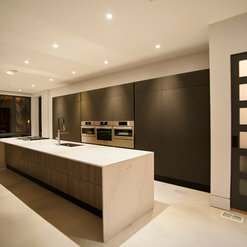 Sebastian and his team are professional, timely, anticipatory and produce a great finished product. His pricing is right in line with others I had quoted. They brought my vision to reality and I am beyond impressed. I have recommended to many friends and family who have all had the same great experiences with this company. I cannot wait for New Explode to do my next project!! First let me say, Sebastian and his crews are beyond friendly. The work they do is GREAT! Crews would show up in the driveway at 6;30, waiting to start at 7. The thing I like the most is that they show up day after day till the project is finished! Dealing with contractors as you know can be quite a challenge. After firing my original contractor for showing up 2-3 days a week ,I cannot express enough how GREAT N-E-C really is! My house looks AWESOME!!!!!!!! If you want a pleasurable experience, meet with Sebastian on your next project! I don't have enough kind things to say about Sebastian Micle and his crew from New Explode Construction. 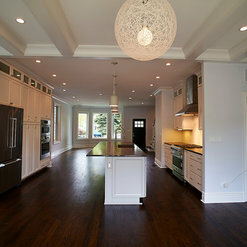 They gut rehabbed my landmark building in Ukrainian Village and converted it from a 3 flat to a single family in only 9 months. They work fast, they have very competitive prices and most importantly they do quality work. Sebastian's crew are polite and friendly and Sebastian himself is a delight to work with. 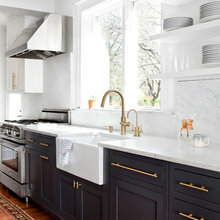 We bought our home in the Spring of 2017 and although we only wanted to fresh up the space with new paint and the necessary polishing initially, we then decided that we want to remodel the entire house. Since our new plans included new kitchen and new bathrooms we realized we needed professional help so we hired Sebastian with New Explode Construction. I know I am not the first person to say this, but remodeling can be very stressful but I was very comfortable with Sebastian from the moment I met him as he is a very nice guy and pleasant to deal with. I had a good feeling about Sebastian when I met him and the same good feeling continued throughout the entire remodeling process, and what was even nicer is that his team gave us the same good, positive vibe. 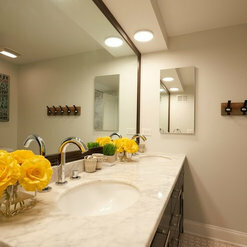 If you ever did any remodeling, you know that there are a lot of surprises behind the walls and everywhere, and most of these surprises are not good news and this is where a contractor’s experience, knowledge, and calm transfer into less stress for the client. Communication skills are hard to find in this business but Sebastian is truly client-oriented, and he made sure to talk to us at every decision point and that things would be done in a way that would make us happy. Sebastian went above and beyond in several respects, for example working at no extra charge on a plumbing issue in the basement even though the leak they discovered had nothing to do with his work. New Explode Construction’s work was uniformly excellent, professional, on-time, and without any additional surprises in cost increase. 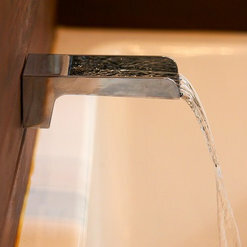 The excellence of work extended from New Explode Construction to every other professional they brought onto the job - from exquisitely skilled tile people doing fine detailed work in odd spaces, to heating pros, to electricians, to a fantastic team of carpenters. I believe that by working with Sebastian we saved a lot of time, and we saved time because of his work focus and his good project management skills, but Sebastian saved us time because he understood our needs and he made it simple. For example, we told Sebastian how we want the hardwood floors and he proceeded without us having to meet with the floor professional. He took the time to understand our needs and to further explain to the installer. I've changed my mind many times during this project, but they still managed to finish everything prior to the agreed deadline. Moving forward, if we ever consider additional projects in our home or elsewhere, New Explode Construction is our “go to” contractor even if we will have to wait a few months for them to be available. I highly recommend Sebastian and his team! 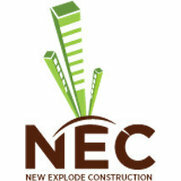 We highly recommend New Explode Construction for your project. Sebastian is a pleasure to work with and knows his stuff! We met with many contractors in order to find the right one, and we are very glad we chose Sebastian as he made the project run very smoothly and was there every step of the way. Unlike other contractors, Sebastian would either answer our call/texts or respond right away to questions/concerns. Besides that, the work was great and he made sure to make our basement feel like an extension of our house by matching all the woodwork and helping with design. 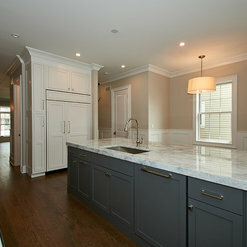 We receive many compliments on the finished product. You cannot go wrong with Sebastian and his crew - I can promise you that! 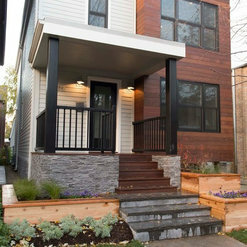 If you are searching for the premier home builder on the North Shore, look no further than New Explode Construction. Here’s why I absolutely liked working with Sebastian: he listens, he executes, and deliver the highest quality home that you can imagine. He is a tremendous talent who transforms your vision into reality. He is an excellent listener who provides thoughtful feedback and always leads you to the right outcome. Sebastian and his team (Luis, Mario, the other Luis) executes every idea that is discussed during the planning stages. Nothing is left out. They delivered a complex project within the aggressive timeframe that we expected. Sebastian managed an outstanding group of subcontractors. He kept the selection process efficient and on track. He leads a team that is cohesive, customer-focused, professional, and always does the right thing for their client. In the case of the large home they constructed on our behalf, their forward-thinking design, first-class quality of material and exceptional workmanship created a monument that has exceeded our expectations. I recommend this company unequivocally to anyone who desires to work with the absolute best designer and builder for their new home. Thank you so much for your review Gabriela. A pleasure to work with you on such an amazing project. Wish you all the best in your new home! 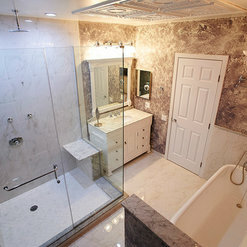 We just finished a large master bathroom remodel, and consider ourselves lucky that we found Sebastian and his team. He is an experienced manager and kept our project on track. He is knowledgeable, patient and professional to work with, and a responsive communicator. Like most remodels, we had a few surprises along the way and he handled challenges well. His staff did good work, and his subcontractors were very good—especially his tile person Adrian. He really is an artist with the tile—excellent attention to detail. It turned out stunning. And we love the heated floors that he installed. 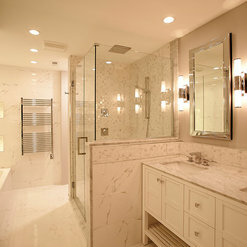 The bathroom is gorgeous - beyond our expectations! A big thank you to Sebastian and his team! 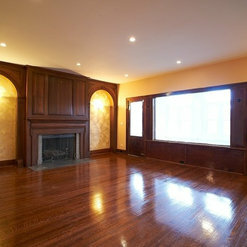 We hired New Explode Construction to sand and polish our hard wood floors. They did a fantastic job from start to finish! Sebastian and his crew were professional, extremely knowledgeable, on time, and kept us informed every step of the way to ensure we were getting what we wanted and were satisfied with the finished product. I highly recommend them for your next project! 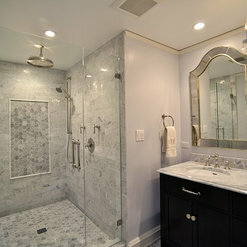 After interviewing several contractors to renovate a master bath and guest bathroom, we ended up with New Explode and couldn't have been more pleased with the work that was done. We had an excellent experience with Sebastian and his entire team. They were reliable, honest and very hard working. They completed it in a timely manner and kept us within our budget where we wanted to be. I will definitely be using them for future projects and have already recommended them to others. As a novice home renovator facing numerous decisions and stressors, Sebastian and his team have been the most positive point throughout the entire process. He was involved from the beginning of the project, offering design and layout ideas and spending time with us before signing a contract. As the project progressed, Sebastian was timely, considerate, honest, and trustworthy. His work was impeccable and he attended to every detail. 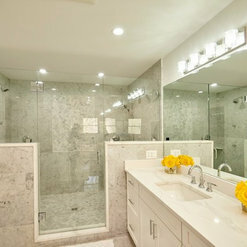 The subcontractors that he brought in all did great work and managed permits and inspections flawlessly. While every project has surprises, Sebastian stayed true to the proposed costs and contract, never cutting corners on the work. We asked him to add details such as cubbies, paneling, and built in shelves and all were done in a rich-looking manner. 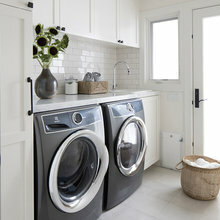 He truly cared for my family and our well-being throughout the renovation. We recommend New Explode Construction wholeheartedly. It was the best decision we made for our home. 16 Ideabooks for New Explode Construction INC. Commented: What is the wall color please?Hi! Thank you so much for your question. 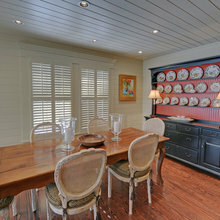 Here it is: Benjamin Moore Ceiling is Decorator White Flat and walls are Benjamin Moore Marilyns Dress 2125-60. Good luck with your projects!